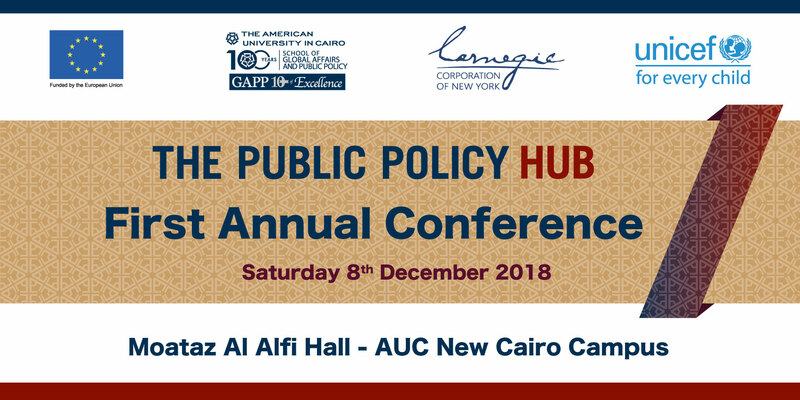 The conference, which is organized in cooperation with Carnegie Foundation and UNICEF Egypt, is being implemented within the framework of the Public Policy HUB project. This is an initiative that started in October 2017 within the School of Global Affairs and Public Policy at the American University in Cairo, and which aims at the development of a cadre of well-informed and seasoned policy developers and advocates, while simultaneously fostering and promoting creative solutions to the challenges facing Egypt today. The conference will discuss the policy issues related to public administration reform, economic and social empowerment, and enhancing the welfare of Egyptian children. Policy research teams will present policy papers on their relevant theme. In order to enrich the discussion, an invitation has been extended to representatives of all concerned institutions, including the government, the private sector, and civil society. The conference will be from 9:00 am to 4:30 pm, Saturday, December 8, 2018, in Moataz Al Alfi Hall, AUC New Cairo. The event is public, but registration is needed to ensure organization at the event.